Keeping up with all of this news is hard work all of a sudden! The character profile page has updated too with some of the designs. If we assume that the layout is meant to be symmetrical, and account for the fact that there will be one space left once all of the characters above are added, I'm guessing we might be seeing an appearance by everyone's favourite Demon King before the series is over. The first press copies of each volume (both the Blu-ray and DVD editions) will also include an exclusive audio CD with an unbroadcast episode of the new Hoshi Souichirou and Seki Tomokazu's 'Sengoku Basara: Judge End' Radio show. Additional bonus features are to be confirmed. I've included the Amazon Japan links in case anyone is really impatient, but if you prefer to buy elsewhere I'm sure it will be available elsewhere very soon. Please note that the Japanese home video release probably won't include any subtitles; many fans overseas may prefer to wait for FUNimation's home video edition. As well as releasing the next batch of design sketches, today the Japanese media outlets revealed the stories which will feature in the next four episodes of the show. The reason that the stories are posted in advance is because the mainstream anime magazines publish their television preview guides on the 10th of each month. Please be aware that these summaries naturally contain spoilers - especially for viewers who haven't played the games. If that doesn't bother you, click below for details of what we can expect! The news that Toyotomi Hideyoshi was defeated by Tokugawa Ieyasu has spread throughout the land of Hinomoto (Japan). Ishida Mitsunari has returned to Osaka Castle in despair, vowing to carry out his revenge against Ieyasu. The Saika-shuu is the greatest mercenary group in the Warring States. In order to obtain that power, Ishida Mitsunari heads towards the Saika village. Meanwhile, declaring that the power of bonds will unite the land of Hinomoto, Tokugawa Ieyasu heads to the Saika village as his first step to forming alliances with the other warlords. Back in Oushuu, Date Masamune regains consciousness, and at the same time Sanada Yukimura struggles with the loss of Takeda Shingen. What will the future bring for the two of them...?! Having entered into a contract with the Saika-shuu Maeda Keiji begins to search for Matsu, who is currently missing. Over in Kai, Sanada Yukimura hurtles away towards Echigo and the God of War, Uesugi Kenshin. In the hope of forming a bond, Tokugawa Ieyasu has gone to meet with Kobayakawa Hideaki. As soon as Mitsunari discovers this, he too heads towards Hideaki. With furious emotions stirring again, a clash seems inevitable...! Ishida Mitsunari doesn't even remember Date Masamune. The pair's reunion at Ueda Castle becomes the source of even deeper animosity. Yukimura stops Masamune just before he gives into his rage and lashes out, and the uncontrollable feelings of anger make a battle between Masamune and Yukimura unavoidable. Elsewhere, Tsuruhime is searching for Ieyasu, seeing a great darkness in his future. At the same time, Chousokabe Motochika and Mouri Motonari have moved towards Kyushu to meet with Shimazu Yoshihiro, Kuroda Kanbee and Ootomo Sourin, having been ordered by Yoshitsugu to take control of Kyushu's strength. The pace is picking up as the world heads towards Sekigahara...! Edit 10/07/2014: Thank you to Lenievi for pointing out a mistake which messed up the meaning of one line! It's now fixed. So happy to finally see Sorin!!! Yoshiaki ☆☆☆ Ha! I did miss him from the cast. Maeda couple, Sorin, Shimazu, alive Hojo god just how will all these characters have time to appear!? Am super excited about new episodes now that I've watched it again and mostly gotten used to the lower budget/different music and stuff for this. I suspect that all of the NPCs from the game will only have small roles unless the show is somehow able to keep everything moving at top speed for its entire run. Even though I miss the funny dialogues with the regular soldiers, I'm glad they're focusing on the main characters from the games (I loved the four Date soldiers I.G. created but I'll happily trade them for animated Sourin!). Hopefully the simulcast will be finally become a proper 'simul'cast this weekend and the episodes will be available more quickly. I'm still praying they'll create some mini Mame Sengoku Basara shorts or something as an extra for the DVD version to give the minor characters a slightly bigger role. Yes I expect very small roles too but it's still a shitload of people. Nobunaga is going to be resurrected too obviously, I wonder how they will fit that in with the rest of the plot. Those Date soldiers added some humanity to the army. Usually SB soldiers exist to be blown up with super arts or be in the background with same-face. It feels kind of weird that they aren't in this but at the same time I like how it's faithful to the game. I was so damn HYPE after I've watched the first episode of this show yesterday and everything was so truly remarkable indeed! I was so speechless because its too AWESOME!!! If Sourin shows up, then no doubt that Muneshige will be there alongside with Sourin too! I just can't wait for Nobunaga Oda to be resurrected around episode 10 or 11. Imagine All BASARA warriors reunite together to defeat the Demon King once again for the true final battle! 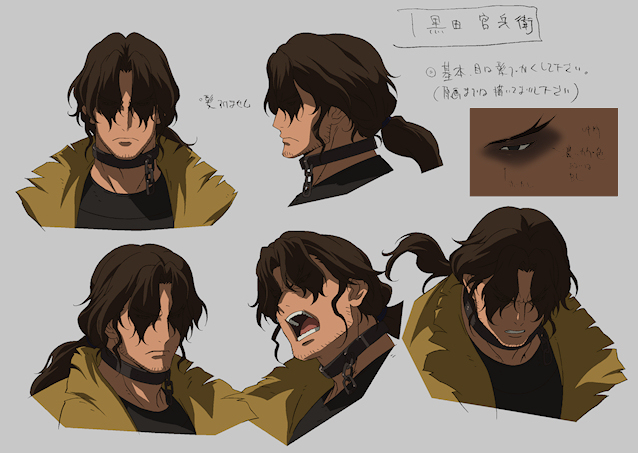 Speaking about the NPCs, I am so looking forward to the appearance of Harumasa Nanbu because he is my most favorite NPC character. I don't know why, but when you guys said that he might have a small role in the movie, it got me thinking that he would be used by the villainous Tenkai as his advantage to resurrect Lord Nobunaga Oda? Because Harumasa has the ability to revive the dead people so, Oichi and Harumasa Nanbu both would be the best resources for Tenkai to start the 'Banquet of Darkness'. Hmmm! I wonder whether it would be best if they show Nobunaga for the inevitable demonic climax (which seems to be a definite possibility) but then save the complicated Hisahide/Nobunaga/Mitsuhide stuff for a possible sequel? Otherwise I cannot see how they'll manage to fit everything in! Hisahide isn't really someone that can be rushed given the way he always seems to move at his own pace (hehe). I guess the first hint about Hisahide will come with the Date troops heading back to Oushuu. That's an obvious moment for them to give him a subtle cameo if they're planning on him taking a small role, but it sounds as though they are planning for Kenshin to be the main event on the journey home (which I would also be ok with). My personal view is that they'll save Hisahide for a potential Sengoku Basara 4 anime (or a direct sequel to this one with his and Tenkai's Utage stories being more important). After establishing the Kotarou-Ujimasa relationship properly in Judge End, fans will understand the ongoing situation with Hisahide much better in future adaptations so there could be quite a few interesting subplots. Appearances by the NPC warlords from 3 would be cool. I hope they at least cameo somewhere in the background but I don't think there will be time for any of them to get an expanded role. It would be cool to see them as minor characters like a few of them were in the movie! I can't wait until tomorrow! I really hope the official streams are finally up by then so people can watch on time. SOOOURIIINNN! Much happiness. I must say, though, this is looking awfully crowded. I understand they want to show most everyone from the game, but... As much as I love Sourin, I'd be happier if he was featured in some funny shorts instead of being what seems like cannon fodder in the main story. "But Yukimura's Ueda Castle is on the way to Osaka..."
It seems impossible to imagine that Sourin will get a very big part in the show, though so long as they can cram in as much Xavi love as possible to lighten the mood then I'm ok with it. He'll have his three heroes (and Tactician) all together in that episode too by the sound of it so I'm expecting mischief. I can already see the castle trudging slowly towards Osaka, with Yukimura standing on the highest roof being all "FORWARD! FOR OYAKATASAMA'S GLORY!" Sorin brainwashing everyone would be good bonus material though. I love being proved wrong in my doubts! This is shaping up to look better than I had hoped! It's taking the non-Japanese companies absolutely ages to announce their plans, isn't it? I'm guessing everything will suddenly come together on Saturday and they'll add two episodes in one day, one for free users and the second for subscribers. It's annoying seeing titles they announced after Judge End already on their schedule. Speaking of which, it would be a fine time for Capcom to cross-promote the game on PSN in the west to capture a few new fans who might be intrigued by the darker tone this time around. I hope they try to give it a push before it's too late to make the most of this opportunity. Yeah. :( It can't be helped, or at least I can't help it. When I try talking about why watching stuff through official channels is good, I always come off as preachy and and annoying and stuff. It WOULD be, but I highly doubt Capcom actually will. I wonder, though, if it would be possible to talk one of those localization companies like XSeed into wooing Capcom and letting them take on localizing the games they don't want to localize. I do feel that the industry needs to give preachers like us a chance by making titles available worldwide; it's very hard to tackle the problem of people making content available without permission when the media companies are shooting themselves in the foot so comprehensively by greedily forcing region locks on everything. Foreign fans then distribute the series amongst themselves, and in the end even fans in countries with adequate streams just default to the unofficial methods. The weird silence we're getting about the stream starting up doesn't help, either; it's natural that fans want to see the show before risking having it spoiled. I get around the problem in a way I'm morally comfortable with, but even then I'd much prefer to support FUNimation's stream too as that's the most important one for the future of the series in the English-speaking world. It's really concerning now that we're just like 3 hours away from roughly when the episode should be ending. :/ Like I checked the Funi blog, said to check the "Samurai Kings" page, nothing about simulcasts or even the new series. Like, no, it's not going to get as many hits as Free! (nothing against Free! mind you! o:) or One Piece or what have you, but c'mon, show a little respect for Basara? ;_; For us, please? I imagine things aren't too good with the European or Australian streams either. Sadly, I think it may be a pipe dream to live in a world where westerners have easier access to the series, but it's an admirable one. Maybe one day! Side note, what I really am curious about is if Capcom totally shot themselves in the foot by localizing the first on as Devil Kings or if that's just a scapegoat excuse the fandom applies. I mean the first Samurai Warriors sold pretty well stateside, so I imagine bringing Basara over (maybe adding the priming since apparently the first game was kinda poor without it) mostly if not completely unchanged beyond the text and dubbing would have made it successful without pouring more money into it than needed to revamp the whole thing. I'm not that familiar with how the FUNi system works but it looked like they just suddenly dumped their other simulcasts online with no advance warning, so I'm checking this page for news. Still no movement from any of the European broadcasters either so there seems to be some kind of universal hold-up. I don't think you sabotaged anything by taking a peek when there was no official version available yet - so long as enough fans visit the real simulcast too then there's no harm done!